Black Panther written by Nnedi Okorafor. Black Panther: Long Live The King (2017-2018) #1 written by Nnedi Okorafor and illustrated by Andre Araujo is now available for all lovers of comics. Black Panther is the one movie event that is awaited by the Black People Multiverse (like the Marvel Universe). The movie set to land in February 2018 stars of the most well-known actors on the planet including Lupita Nyong’o, Danai Gurira, Daniel Kaluuya, Florence Kasumba and many others. We all know that February is too far so we here at JamesMurua.com have a suggestion that should tide you over until then. So you won’t believe this but Black Panther didn’t just appear on Captain American Civil War but first appeared as a superhero of the same name from Marvel Comics in 1966. Black Panther’s day job is as T’Challa, king and protector of the fictional African nation of Wakanda the most technologically advanced on the planet. You can read more about this hero on his Wiki page. As the Black Panther and an Avenger, T’Challa has had to save the world time and again — but those duties pale in comparison to his responsibilities as king of Wakanda. As the nation rebuilds in the wake of revolution, T’Challa finds his people besieged by a massive monster tearing through the country, leaving a trail of destruction in its wake! From acclaimed novelist NNEDI OKORAFOR (BINTI, WHO FEARS DEATH) and illustrator ANDRE ARAUJO (SPIDEY, THE WICKED + DIVINE) comes an adventure set in the world of Ta-Nehisi Coates’ landmark BLACK PANTHER run and told in the Mighty Marvel Manner! Part of the comiXology Originals line of exclusive digital content only available on comiXology and Kindle. This title is available as part of comiXology Unlimited at release. 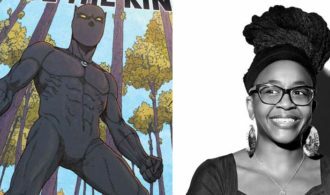 Nnedi on her Instagram promises that the sixth comic in this Black Panther series would be set in Lagos, Nigeria. You can read the preview for this new comic here and also buy it here.